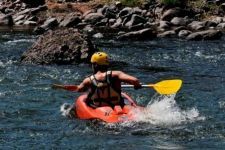 For those who love water sports, kayaking can be practiced along the different rivers in Tucumán while you enjoy the unique local landscapes. The province has a high security technology for this sport and also it has some kayakers spread around the world. Tucumán receives visitors from different countries such as Germany, Chile, Slovenia, Costa Rica, Italy and the United States. Previous experience is not necessary because each place has professionals who can help you.